How can you challenge the brain using basic Sudoku concepts but using a nine-letter word? The answer is using an alphadoku puzzle to engage the brain, activate problem solving skills and make learning fun at the same time. 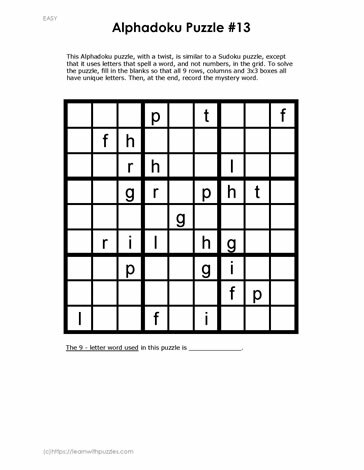 To solve the puzzle make sure that each of the nine unique letters occurs once in each column, once in each row, and once in each three-by-three grid.